Hi Marcus, can you tell me a little about yourself and what you do? My name is Marcus McKinnon and I currently work at Grace Lutheran College, Rothwell QLD, Australia as the Head of Design Technology. I teach students ages 11-18 in workshop practices, safety, skills, design and technologies using materials such as woods, metals, plastics and electronics. How did you hear about Roarockit? 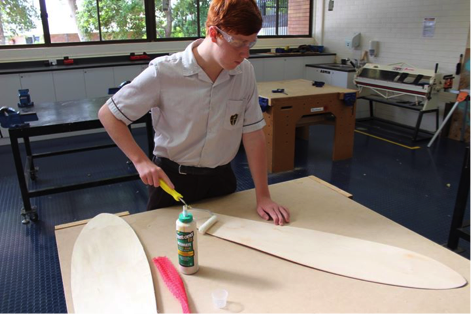 What inspired you to bring skateboard building into the classroom? I first heard about Roarockit a year ago when I was searching online for skateboard making ideas. I started to follow Roarockit on Facebook and was impressed and inspired by the success stories on the feed. I watched a number of YouTube building clips of the making process and decided to have a crack at making a board for myself. I have a habit of trialing new ideas in front of students that are busy working on other tasks in my classes to gauge their enthusiasm for a potential project. 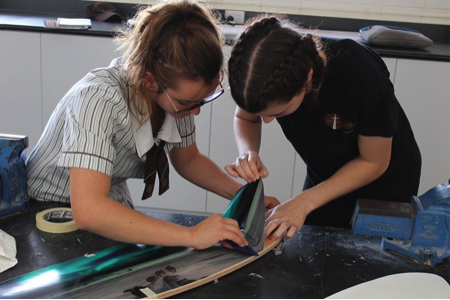 With overwhelming interest, students were intrigued and excited by not just the finished project but the process involved in making these boards and therefore the concept was born into the curriculum. How do you feel this program benefits the classroom? How do you work this into your curriculum? My goal for this unit was to show students how timbers could be manipulated into curved shapes and how that might be used in everyday society. 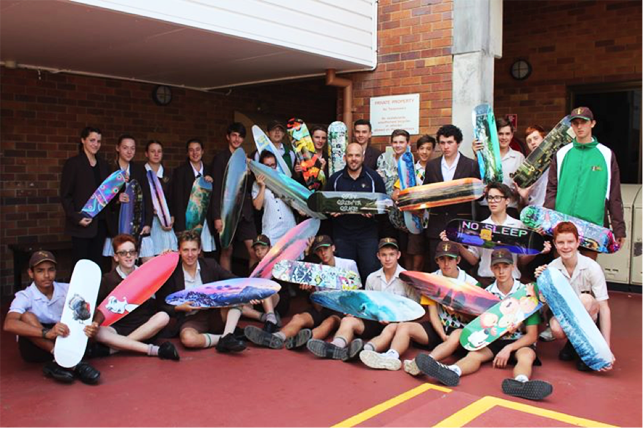 Making skateboard decks was a really cool and exciting way to do delivery this content and intrinsically motivating for the students. Student’s researched theory behind manufactured boards such as MDF, plywood and sandwich panel veneers as well as the history of skateboard development from conception in the 1950’s to now, how materials, manufacturing process, shapes, sizes and designs have been developed over time and why. 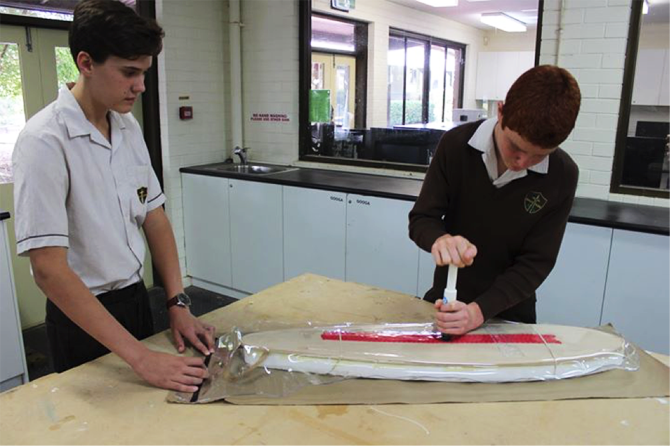 Putting theory into practice and using the Roarockit technology and process, the students designed and made their own individual boards. How did it turn out? Are the students riding their boards afterwards, or do they use them more as an art project? 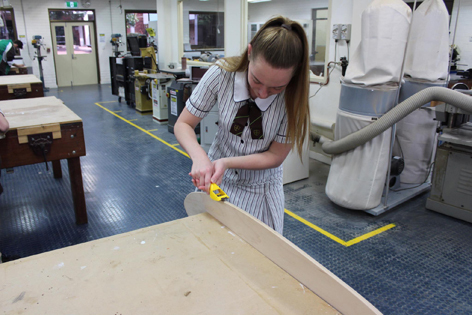 This has been a great success story; the students have engaged in this opportunity to build their own boards and the results have been amazing. Most students have made the board to ride but some students have chosen to make some wall art in their bedrooms. The process however was still the same and those who have never owned a skateboard are excited and enthralled to be out there enjoying the sport. How were you able to get skateboard building started in your class, did you have to jump through any administrative hoops to get there? I didn’t have any issues from school at an administration level. They trust the process, the techniques used for constructions and we purchased the best materials we could find. Obviously, they always have in the back of their minds that the project could pose a legal question should someone hurt themselves riding the boards but at the end of the day the risks associated with making a board are very limited and the benefits through curriculum and student engagement far outweigh the associated risk. When taught correctly and proper planning has taken place, content is delivered well and risk is always minimised. 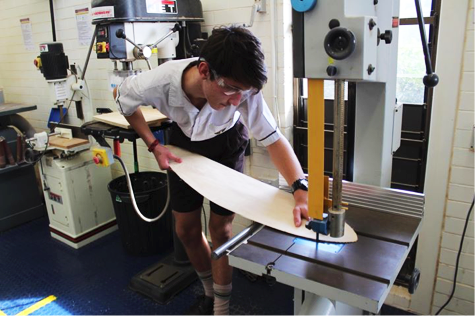 To get a similar program going at your school in Australia and New Zealand, access Roarockit skateboard building materials through our local supplier here.